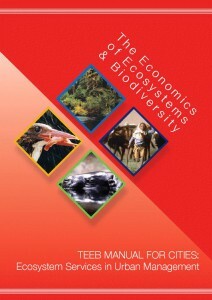 Summary: TEEB Manual for Cities builds upon the TEEB reports, tailoring information specifically for cities, drawing on ICLEI and IUCN’s Local Action for Biodiversity Pioneer Project. The manual highlights how a focus on ecosystem services and their valuation can create direct benefits for cities. It also provides stepwise guidance on how to do this illustrated by in-depth case studies.